Without question Tim Lane is one of the most insightful, reflective, and sharpest artistic talents in the alternative comics scene today. 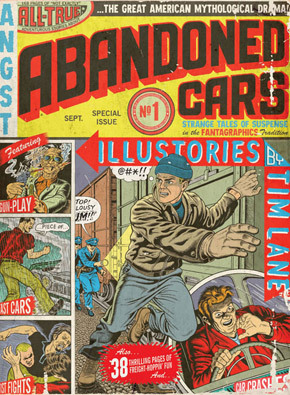 In Lane’s book, Abandoned Cars, the term “graphic novel” feels much more apt and appropriate than any other release in the comics world within the last several years. This exceptional work, first released in 2008 by Fantagraphics and now available in a softcover edition with 2 different covers to choose from, has more in common with prose authors of a grand, yet lonely, American literary tradition than anything else on the comic store shelves. The restless spirit of works by Steinbeck, London, Bukowski, Ginsberg and, perhaps most importantly, Kerouac haunt the beautifully illustrated black & white pages of Abandoned Cars, proving their continuing influence on a young generation of writers of which Lane is now (or at the very least should be) at the forefront of. Yet, the literary kings of the past are not the only important icons of Lane’s tales of lost love and unfulfilled destinies. A young Brando and Elvis are also featured, indelible figures tied to a time in America’s cultural psyche that are well remembered, but the likes of which will never be seen again. Although many of Lane’s inspirations lie in the past, the tales in Abandoned Cars are rooted in the (more or less) present day. The daydreams of wandering prior generations cannot be attempted in the same way now as our country has changed too much in the time in-between. Our cultural landscape has reconfigured the American dream too make it less attainable, but more alluring than ever. It’s the have-nots of America that take center stage in Abandoned Cars, the ones whose dreams have evaporated into stale, cigarette smoke filled air. 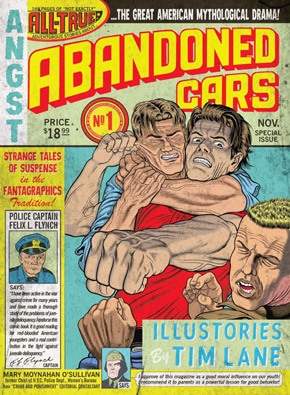 The cover of Abandoned Cars promises “Gun Play, Fast Cars, and Fist Fights!” and these are certainly found within the book’s pages, but not in the action packed thrills sense the cover’s pulpy graphics suggest. Here are glimpses into the underbelly of the American dream where bad luck, bad decisions, and simple fate have led the character’s to the places in which they are now. In one tale, titled “The Drive Home,” the 41 year old John wishes to reverse a past in which his failed marriage caused him to hit the open road looking for something, anything to push away the violent pain deep in his heart. During his six years away he is involved in any number of negative altercations, including a random fight in a bar parking lot which leads to a vicious beating at the hands of a police officer. In “Open Road” another wandering soul relates the commonalities of the saddened strangers he meets in his travels, and how the American dream has failed them all so badly. The stories are loosely bridged by visits with a manic-depressive man who has alienated himself from the rest of the world by choice. Though he believes himself content to be separate from those around him he still finds interest in the other souls of the city. “Doo-Wop and Planet Earth” shows how a man’s passionately stated plea to a woman he just met to come home with him is met with a promise from her we know will never be fulfilled. In the brief tale’s silent final panels we feel a stillness so inescapable and complete it’s as if the emotional vacuum he feels inside has leaked out into the world around him. Fate plays a heavy hand in one of my favorite stories from the book: “Outing.” The story begins in a dank bar in which the two main characters, Marty and a nameless narrator, narrowly avoid a fight with an enraged, drunken carny when an old man shoots himself in the face. The man’s self-inflicted shot is not lethal, but the bullet exits the side of his face only to hit and kill another who is siting nearby. Marty and his friend flee the melee only to careen off the rain-slick nighttime road. Our narrator is able to crawl from the wreckage. Marty is not as lucky. Cars play a large role in “The Great American Mythological Drama” and they can be a means of freedom and escape, or, alternately, inescapable doom. The book closes with “The Story of Stagger Lee,” a fact based account of a murder in a St. Louis bar in 1895, the result of an argument between two African American men. This event has dug itself extremely deep into American folklore due in no small part to the large number of blues songs written telling of the event. If one has ever felt the visual impact and emotional desolation that can be derived from a minute, seemingly innocuous detail in life like a beer-soaked coaster, the stub from an unsatisfactory paycheck, or a torn and crumpled bus ticket with a destination that may as well say “anywhere but here”, you will see some of yourself in Abandoned Cars. It is beyond rare to find a cartoonist as acutely attuned to the restless and haunted American psyche as Lane is. Abandoned Cars is the new classic of sequential art.